Palladio ~ Risotto, a Love Story demystifies the complexities of classical architecture and risotto preparation. By following the rules of nature and geometry it’s surprisingly difficult to design a “bad” building. Likewise, following a few simple instructions, cooking risotto is much less complicated than widely presumed, usually with terrific results. In the midst of Gary’s architectural studies at Harvard’s Graduate School of Design, he was offered the opportunity to spend a summer in Italy. It wasn’t just any locale, not that there could be a bad part of Italy. He was to explore Vicenza, the “Mecca” for architects. Vicenza is a leading city in the Veneto, inland from Venice, home of Andrea Palladio, the 16th Century superstarchitect who created iconic buildings which recapture, enhance and disseminate the glories of classical design. 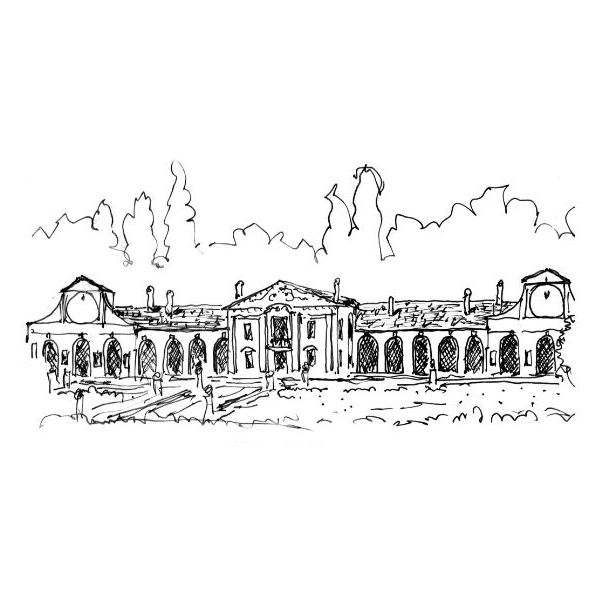 Palladio’s distinctive ambition and skill of composition brought the forms of ancient Rome to simple country houses as well as notable buildings. Palladio wrote the Quatro Libre – the Four Books of Architecture that became the pattern books for designing “correct” buildings for centuries to come, still shaping today’s tastes and standards. Palladio’s buildings – and design elements – have been both copied and emulated continually for almost 500 years, in all corners of the world. That summer in the Veneto for Gary was an introduction to the charms and romance of this storied region: memories of sunsets at Lake Garda and late nights walking the pathways of Venice, drives through the countryside to small towns with Medieval castles and renowned vineyards, long rows of Cypress trees and country restaurants where the day’s freshly selected produce becomes the evening repast. Gary’s host that summer was an architect of note, and a peer of the local cognoscenti – industrialists and professionals of culture whose lives were out of the pages of Italian Vogue magazine. It was stylish and sometimes grand, but what stayed with him was the daily preparation of a mid-day meal with just-picked ingredients from the nearby marketplace, all amidst the surroundings of 16th Century architecture – so pure and refined, and timeless. Gary’s heart was stolen: he would return to the Veneto many times, as well as explore other areas of Italy. Years later, out of school and having established his design practice in New York City, Gary designs residences across the United States and abroad. Gary was invited to participate in the House Beautiful Makeover Showhouse, which brought him “home” to Chicago where he was raised. Gary was offered the not-yet-built “Kitchen Wing” being added to a century-old North Shore home that was about to be renovated. He would be designing this kitchen and adjoining spaces: pantry, breakfast nook, wine tasting room, powder room and laundry. What he meant was, as she understood, that in the preparation of risotto all of the kitchen functions are utilized, from food storage to prep to cooking to clean up, and the relationships of those functions must be set in clear paths by the designer. A full page photo of the kitchen Gary designed appeared in the Chicago Tribune with his quote. House Beautiful requested that Gary go on the road to speak about design. He agreed if, and only if, he could make a risotto while giving a talk. A few talks under his belt, and he intuitively linked Palladio with risotto – and this cause celebre was born. Of note: The Palladian Villas were farm houses, often decorated with temple fronts to suggest the impressive stature and wealth of their owners. This was one of Palladio’s inventions. The owners lived on their property for the growing season, placed in agricultural settings, serving as an escape from nearby cities – opportunities to live in nature, however grandly. The size of the villas were increased by attaching out-buildings, imagined symmetrically creating one imposing large structure. Crops grown before the 16th Century were grains to feed animals, not as much for human consumption. Into the 16th Century, agriculture became a more valued commodity for income as well as the palate. In his research, Gary had not come across rice as a crop this far north above the Po River valley until a few years ago when returning to the Villa Pisani near the village of Bagnolo. There, he was given a clue. Turning on a country road that climbs over a small river to access the Villa, there was a street sign: Via Risaie. He had seen this sign previously, but not contemplated its significance. Returning in 2017, an Italian friend explained the meaning of “Risaie” as a reference to a rice mill or paddy. He had been to this grand home many times, including as a guest of the its resident Contessa to a lunch on her elegant loggia. One visit even included a tour and viewing of the 17th and 18th Century maps of this villa’s properties and extended farm fields. As this property’s nexus with past rice farming became increasingly obvious, he returned to photos of these maps and the fields, finally noticing “risi” indicated among the engraved texts. Palladio ~ Risotto, forever connected. Later, completing this process of initial discovery, Gary also found various entries about the history and origin of risotto. One entry that spoke to this story was that the vegetable dye which dripped into the rice bowls of the 16th Century workmen constructing the Duomo in Milan. The dye being saffron for the color also flavors the rice. The resulting dish: Risotto Milanese, “canonized” in the same years that Palladio was building villas 125 miles to the east. Palladio and Risotto have captivated Gary’s thoughts for the last few years: Research has provided pathways into the suggested histories of risotto as it swept the Italian peninsula. As a food, risotto can take on many characteristics based on the character of the added flavors. 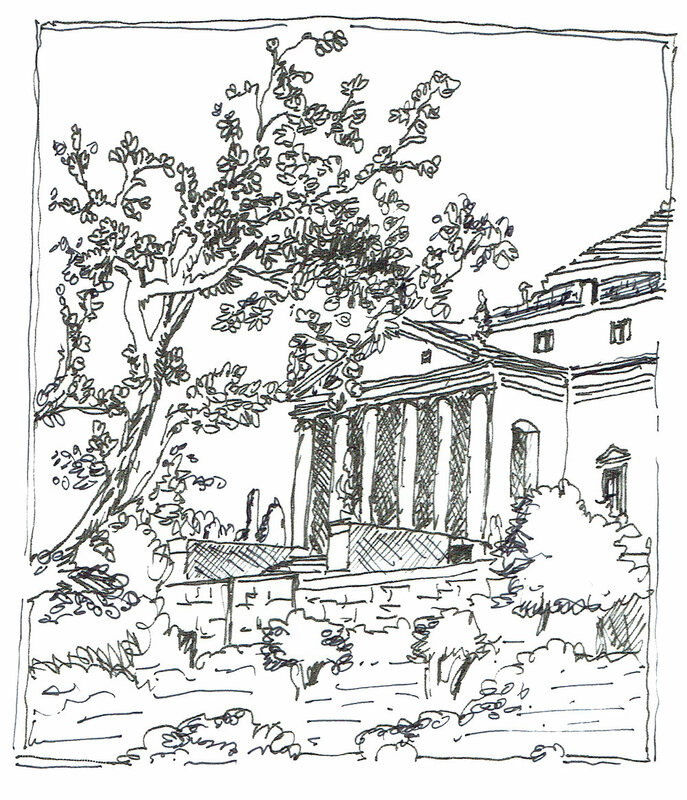 Likewise, Gary has endeavored to understand what Palladio what he learned from the classical traditions of Rome, gathered from his writings and sketches made on his 16th century travels there. Gary has enjoyed many journeys to the Veneto from villa to villa to see the evolution of Palladio’s designs as he integrated the ancient forms and details into his projects, and then, watching how his body of work and writings influenced architects throughout “modern” history into the 18th, 19th and 20th centuries. This has both formed a body of information for Gary to consider for understanding Palladio’s work and inspires Gary in the work that he does.